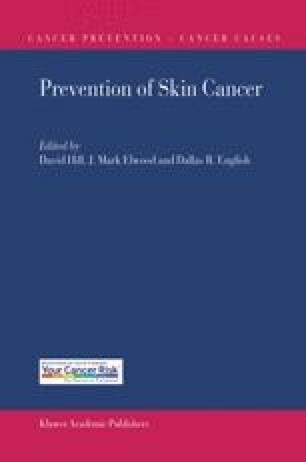 There is overwhelming evidence, discussed elsewhere in this book, that exposure of the skin to UV-radiation can lead to, or at least contribute to, the development of skin cancer. The sun is the major source of UV-radiation to which the human skin is exposed. Within the earth’s atmosphere, ozone serves as a partly protective shield by absorbing most of the effective part of the UV-spectrum and thus preventing a major part of the harmful UV from reaching the earth’s surface. Depletion of atmospheric ozone has been observed over large parts of the globe in recent decades, and it was predicted that harmful UV-radiation levels at the earth’s surface would have increased. The observed decrease in ozone was thought to be related to the large-scale emissions of halocarbon compounds as a result of human activity . In 1985, in view of the scientific evidence that the emission of halocarbon compounds could lead to ozone depletion, the United Nations Environment Programme (UNEP) initiated the Vienna Convention to protect the ozone layer. This provided the framework for the discussion and implementation of international restrictions on the production of ozone depleting substances and led to the first international agreement on the reduction of the production of ozone depleting substances in 1987 in the Montreal Protocol. Following scientific evidence that ozone depletion was actually occurring, the Montreal Protocol was strengthened in several later Amendments.